14 Reasons Why I HEART Blendtec Over Vitamix & Valentine Special! Through February 14th, you can get $40 off the purchase of their newest edition… the Twister Jar. This is the lowest price ever for this amazing jar! The Twister Jar can create extra-thick blends like nut butters, hummus, baby food, dips, dressings, thick shakes and more! Compare peanut butter in the FourSide Jar (4-5 minutes) vs. the Twister Jar (35-45 seconds). The jar can be loaded up to a full 16 oz., which is incredible for dense ingredients. These jars normally sell for $129, but get it today for only $89! Of course, if you don’t have the blender base… read on. Over 2 years ago I was blessed (and thrilled!) to receive Blendtec to review and compare it to Vitamix. I had been using Vitamix for about 3 years and it did pretty well and I was, for the most part, happy with it… until I got Blendtec. Since Blendtec arrived, I have retired Vitamix and don’t miss him one bit! Sorry Vitamix! Below I am going to share my fourteen reasons, yes 14 (why does it have to be 10 like everybody else?! 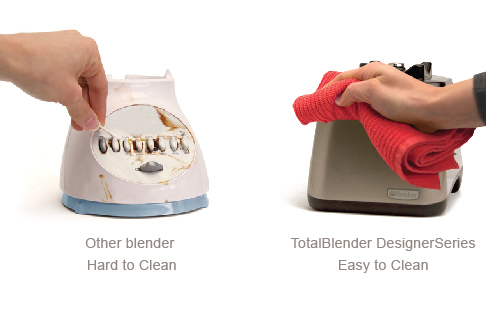 ), why you should have Blendtec helping you in the kitchen. So easy to clean. The whole thing is a breeze to clean! The buttons don’t have cracks and the motor base can be wiped down easily with a wet cloth. The wide square base of this blender makes cleaning so much easier then Vitamix. You can toss it in the dishwasher or put in a couple drops of soap with water and pulse a few times, then rinse and dry it! Nothing gets stuck at the base. It really bothered me whenever food would get stuck at the base of my old Vitamix, especially in the corners where I couldn’t get it with the stick. I would have to turn it off and take a knife or thin spatula and scrape it around to get it moving again. With Blendtec, you can be assured that nothing will get stuck at the base because of its wide square base! Functions like a food processor. I often make homemade salsa, chopped or pureed… depending on what I want. You can throw in any fruit or veggie and pulse for a few seconds to get it nicely chopped. Honestly, though, I still like my CuisineArt food processor and think it does a better job with some things like homemade mayo! 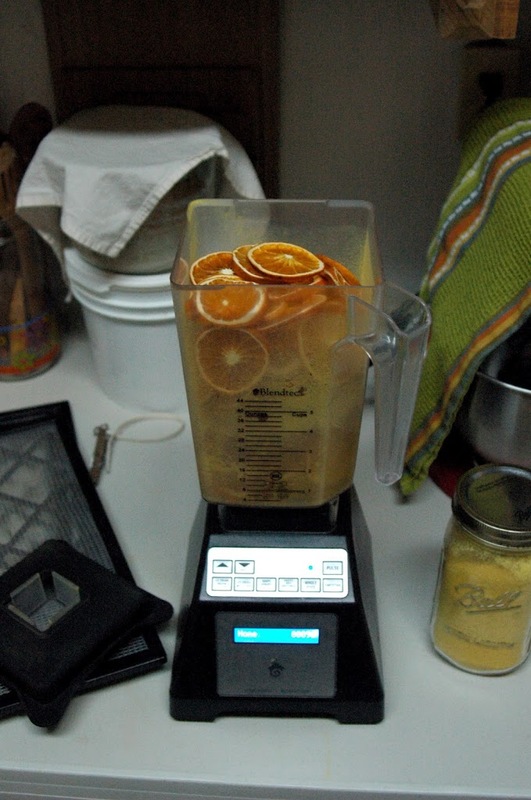 Blendtec also makes wonderful soup very simply & smoothly… much like Vitamix, but better. Grinds grain perfectly. I was shocked by how good this monster can grind grains into fine powder… it can even turn flax seeds and chai seeds into a nice powder! I have tried grinding my grains in my old Vitamix and wasn’t too happy with how hot and gritty it would get. Plus, some of the flour would get stuck in the base. With Blendtec, you can blend both dry and wet ingredients in one container (with Vitamix you have to buy two!) and does a way better job, all because of that wide square base! You can only grind 2 cups at a time, not exactly ideal for large quanities of bread baking, but great for everyday flour needs (ex: pancakes, muffins, crackers, etc.). 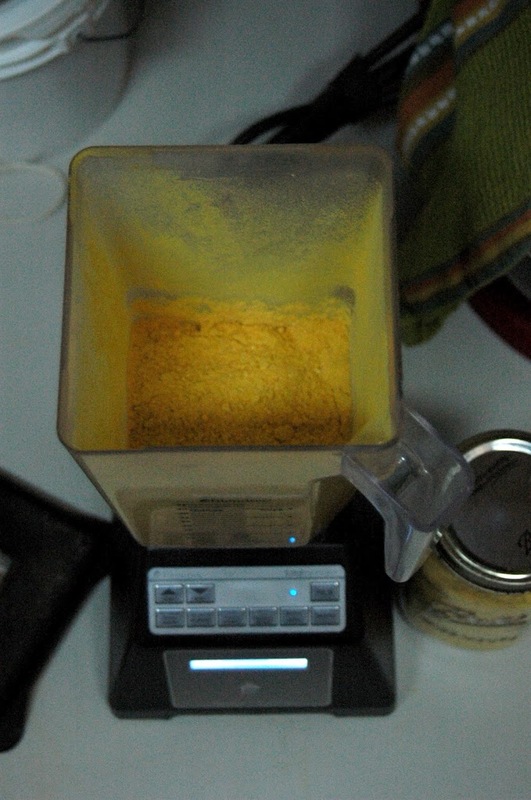 I’ve grind my orange chips into powder in Blendtec and love how quickly it does the job! Makes fantastic “smooth” smoothies. We love our smoothies, especially green smoothies whenever I am able to get fresh lettuce or spinach. I am so happy with my smoothies because they come out so smooth that you really can’t tell by texture what’s in the smoothie. I am able to “hide” some things in the smoothies from my girls and they slurp it up with delight! Another bonus, I can throw in whole raw flax or chai seeds and they are completely grinded smooth with no lingering texture. Never been able to do that with old Vitamix! More versatile. According to the company, Blendtec can replace up to nine other kitchen applicances – no need for a grain mill, juicer, bread machine, ice cream maker , smoothie maker, blender, milkshake maker, coffee grinder or ice crusher. But I honestly can’t live without my ice cream maker or juicer as they do best what they are made to do! Makes smooth sauces with ease. I love how I can throw in a whole apple (skin, seeds and all! ), add a little water and in several seconds get raw applesauce. Makes wonderful salsas, hummus, tomato sauce, mayo and other sauces in just over a minute! But you have to make sure to have enough moisture to keep it going without it getting too hot… normal for any blender. Can do the job itself.Love how I don’t have to guess how long and how high or low of speed to use with Blendtec! This machine is a ‘smart’ blender, with 17 settings to get the job done! It’s simple, all I need to do is push my desired setting and let the machine do its job. I don’t have to stand there, hold the lid down and jiggle around with it like I had to with Vitamix. Blendtec has specific digital settings for pretty much every job and will turn off automatically when the task is done! Totally a muti-task machine… I can get a smoothie going or some sauce while prepping something else or cleaning up. Also, if you have an absent-minded family member, no worries… Blendtec will turn off on it own! Very powerful & compacted. This machine is a monster, I am not kidding! It can tear through anything from 1560 watt with a 3 HP direct-drive motor and does not need any extra space to fit its mighty engine. It has run powerfully since the first day I used it and I’ve used it over 930 times! I couldn’t say that for Vitamix, after just a year of using it The overall height is shorter, but wide and can fit in standard countertops. I couldn’t do that with old Vitamix, had to put the container next to the base because it is too tall. It is compacted enough that you can take with you when traveling, so you and your family can eat healthy while on the road! Professional & very durable. After having Blendtec for over 2 years now, I can’t believe how durable it is! This Blendtec machine is popular in the majority of professional businesses and known for its high quality guarantee. Better technology. I love how it shows on the screen how many times I’ve put Blendtec to work… over 930 times and it still works like new! When you run Blendtec, a timer comes up to show how much time is left before its done. Like I shared above… it is a ‘smart’ blender with 17 settings to get the job done well! I appreciate how the company took care to design their blenders with a wider base so there is no need to use a stick to push everything into the blade. That was one thing that bothered me about all the blenders I’ve used growing up, the narrow base… it never made sense to me because in order to ‘cut & puree’ your food up, you need room to allow the food to move around the blade, duh! BPA-free plastic.Nice to know that I am not exposing my family to toxic chemicals when using it! Looks pleasantly attractive. I like how simple and neat it looks, not bulky or awkward like Vitamix. Plus, you can choose a white, black or red base. I chose red, but they sent me a black one! Oh well, can’t complain when it was free! Decent coverage.Each Blendtec Blender has a lifetime warranty on the blade so you don’t have to worry about it getting dull on ya! That was another issue I had with old Vitamix, the blade got pretty dull and wasn’t doing the job like they said it would. I was preparing myself to pay for a new blade and try to replace it myself! Blendtec is made with solid-state electronics which are more dependable and less likely to give you trouble, so you won’t have to go through the headache of sending it back for repairs! Now, I’m sure many of you are wondering if all I am saying is too good to be true. It is for real so good and true! Even better, Blendtec recently upgraded their warranty to 7 years. Before it was 3 years, but they’ve been making improvements and working towards bringing you the best quality kitchen appliance. Vitamix and Blendtec are very similar, but Vitamix is more commonly known because it has been marketed better… but the Blendtec company has been changing that. Now, I’m sure you’ve been hearing the name pop up more and seeing it all over the food blogs nowadays. Blendtec is the choice among professionals, especially among the raw foody crowd. Its body can fit on your countertop and one jar does it all, while Vitamix it too tall and has two different jars to accomplish everything. Vitamix doesn’t turn itself off and has two switches that have to be used carefully during the blending process (a pain), while the Blendtec does all the work for you in speed, power and will turn off when done. 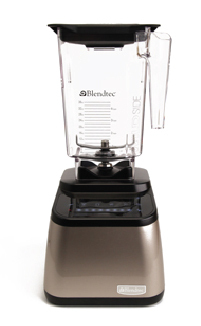 Now, the cost… Blendtec Wildside, which is what I have, costs $474.95… ouch, I know. BUT BUT but when you consider the cost of purchasing all nine of those kitchen appliances that Blendtec can replace… you save a good chunk of $$$ with one fantastic machine! A grain grinder alone can cost around $250 and I don’t even use or like the one I have!! As a missionary, I’ve had to simplify and make use with what I have. 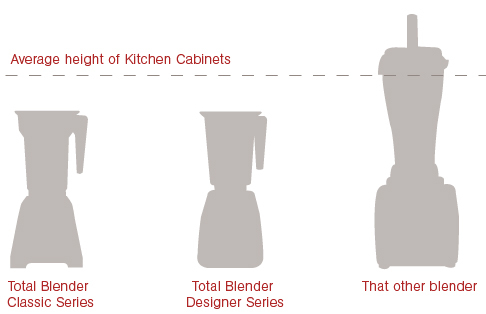 If I had the Blendtec from the beginning… I would not have half the appliances I have in my kitchen right now. Honestly. To wrap it up… if you were to invest in one machine that would help you transition to a whole foods lifestyle, this is the machine you want. It is quality in action. Through February 14th, you can get $40 off the purchase of their newest edition… the Twister Jar. This is the lowest price ever for this amazing jar! The Twister Jar can create extra-thick blends like nut butters, hummus, baby food, dips, dressings, thick shakes and more! Compare peanut butter in the FourSide Jar (4-5 minutes) vs. the Twister Jar (35-45 seconds). The jar can be loaded up to a full 16 oz., which is incredible for dense ingredients. These jars normally sell for $129, but get it today for only $89! That’s almost half off the original price! Small print stuff: Yes, I will earn a small commission through my links and that is no extra charge for you. Thank you for supporting my family this way! I have a Blendtec! Actually we bought a Vitamix over 4 years ago at Costco, and thanks to their return policy we returned it the same week, it was a huge and complicating monster, which made it unappealing to use. Now, just a couple months ago we got ours at such a great price at Costco that included the wildside jar. Prior to seeing at Costco, I’ve never even heard of it! But fell in love during their presentation. I do have a problem making almond flour, it just wants to turn to almond butter instead 😉 Oh well, almond flour is the same price as getting almonds per lb, though it is not soaked/sprouted… otherwise, what a lovely blender, I’m so fortunate. I was so GLAD to hear you prefer Blendtec because it seemed like all the foodies mention Vitamix, I almost felt like I got a second choice machine 🙂 Not so much now, because I agreed with every one of your Likes for this machine! Natalie- Thank you so much for leaving a comment. I was wondering if anybody was going to do that! Yeah, I know what you mean about feeling like Blendtec is the “second-choice” blender when it should be the first! All those foodies out there need to compare… like I did and I know most, if not all, will vote for the Blendtec. I know what you mean about the almonds. It seems to get a little hot towards the end and ends up “melting” the almonds, BUT… you can always freeze the almonds and the contianer. That way it will stay cool. When it starts to get hot… simply put it back in the freezer and let it cool. I know, something that should take a few minutes ends up taking much longer, but it is worth it! Also, I use only the pulse button when powdering the almonds and orange slices. Again, thanks so much for sharing your love for the Blendtec!! Thank you for sharing your insights about why this brand of blenders may be better than others. Those who spend a lot of time in the kitchen could appreciate some of the reasons who provided. Blendtec is definitely my choice…I use it everyday without fail…The size and height is just right for my kitchen area..making smoothies is hassle free and i feel healthier and fitter than before.